Ubuntu 10.10 Installer is going through massive changes. 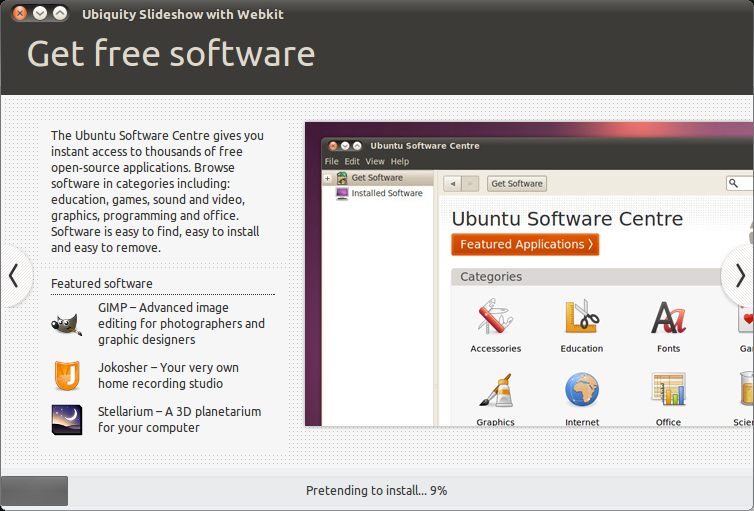 Canonical is leaving no stones unturned and now even the installer slideshow is getting fair amount of attention. 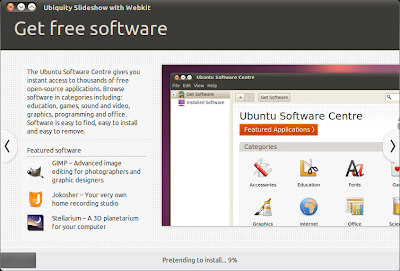 Installer slideshow was introduced during the Ubuntu Lucid release and Canonical aims to bring more polish and simplicity to the slideshow feature. This particular mockup was put together by Dylan McCall. He says, the current Ubuntu 10.10 beta still has the old Lucid installer slideshow and is 'blatantly outdated'. They are working on a new slideshow for Maverick. Though the new installer slideshow will be definitely inspired by the original one, it will constitute a lot a interesting changes. Addition of bigger screenshots and reusing stuff from the Ubuntu tour on the web for a start. As Dyaln puts it, "What I love about the tour is it's really simple and well written and it makes some extra effort to show what you can get. I think this is perfect to go with the new Software Centre, which is going to make those options much more relevant to everyday users."